NASA Earth Observatory image and animation by Robert Simmon, using Suomi NPP VIIRS data provided courtesy of Chris Elvidge (NOAA National Geophysical Data Center). Suomi NPP is the result of a partnership between NASA, NOAA, and the Department of Defense. Caption by Mike Carlowicz. The night side of our planet twinkles with light, and the first thing to stand out is the cities. “Nothing tells us more about the spread of humans across the Earth than city lights,” asserts Chris Elvidge, a NOAA scientist who has studied them for 20 years. 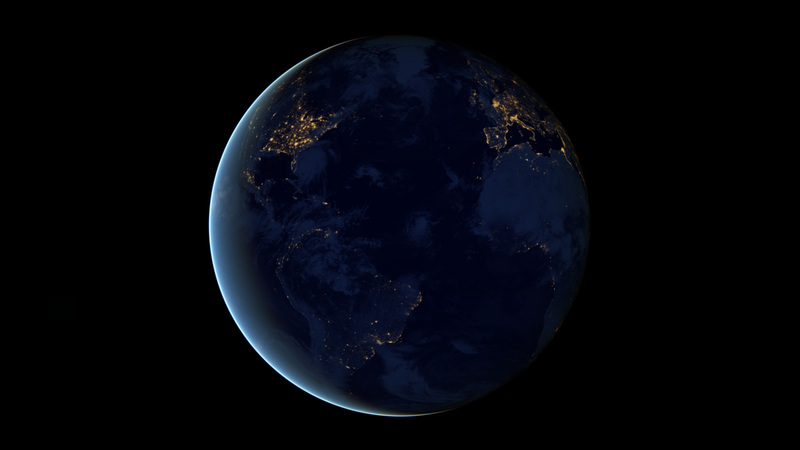 This new global view and animation of Earth’s city lights is a composite assembled from data acquired by the Suomi National Polar-orbiting Partnership (Suomi NPP) satellite. The data was acquired over nine days in April 2012 and thirteen days in October 2012. It took satellite 312 orbits and 2.5 terabytes of data to get a clear shot of every parcel of Earth’s land surface and islands. This new data was then mapped over existing Blue Marble imagery to provide a realistic view of the planet. To view the video of the night lights, click on the link below the image or visit our YouTube page. 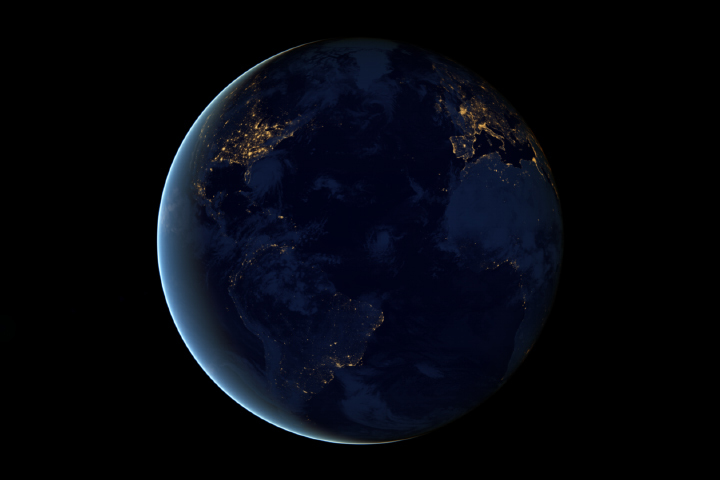 To view many more still images and maps of night lights, visit our new feature page: Earth at Night 2012. The view was made possible by the “day-night band” of Suomi NPP’s Visible Infrared Imaging Radiometer Suite. VIIRS detects light in a range of wavelengths from green to near-infrared and uses “smart” light sensors to observe dim signals such as city lights, auroras, wildfires, and reflected moonlight. This low-light sensor can distinguish night lights tens to hundreds of times better than previous satellites. Named for meteorology pioneer Verner Suomi, the polar-orbiting satellite flies over any given point on Earth’s surface twice each day at roughly 1:30 a.m. and 1:30 p.m. Suomi NPP orbits 824 kilometers (512 miles) above the surface as it circles the planet 14 times a day. Data is sent once per orbit to a ground station in Svalbard, Norway, and continuously to local direct broadcast users around the world. The mission is managed by NASA with operational support from NOAA and its Joint Polar Satellite System, which manages the satellite's ground system.